Richard Pinkett recently researched the stories of the local men who are commemorated on the war memorial plaques on display here at the Mill. These stories were shared in a recent Facebook post. He has now researched the names and stories of the London plaque. 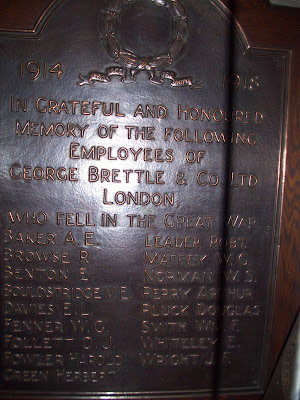 Here is the first information on the men on the WW1 Brettles Memorial. More will follow plus probable updates on these men. Second Lieutenant REGINALD BROWSE 9th Battalion Cameronians (Scottish Rifles) Killed in Action at Kemmel Hill on Thursday 25th April 1918. He was killed whilst serving in 9th Battalion Cameronians with the South African Brigade, attached to 9th (Scottish) Division during a phase of Operation Michael, the German 1918 Spring Offensive. During the Second Battle of Mount Kemmel At 02:30 hours on 25 April 1918 over 250 batteries of German guns opened up on Allied artillery positions with a mixture of gas and high explosive shells. For the next two hours they concentrated solely on destroying gun emplacements. After a short pause, at 05:00 hours the German barrage was switched from the British to the French front line. French soldiers who had survived the horrors of Verdun described it as the worst they had ever encountered. After such a furious bombardment it was considered sufficient by the Germans and at 06:00 hours they launched their infantry to the attack. By 07:10 hours Kemmel Hill was theirs and by 10:30 hours it was all over. Reginald first served as a private in 1/⁠4th Battalion Seaforth Highlanders with the number 2060 and disembarked in France on Saturday 7th November 1914. He was commissioned Wednesday 28th February 1917. 2nd Lt. R. Browse was made acting. Captain while comanding. a Company of the 9th Battalion on Sunday 7th April 1918. Reginald was Mentioned in Despatches London (Gazette Publication) -⁠ (Since killed in action.) on Tuesday 21st May 1918. Reginalds effects were sent to his mother’s address given as 2 Crown Crescent, Scarborough. He has no known grave but is commemorated on the Tyne Cot Memorial. Corporal 200905 E J Benton 1/⁠4 Battalion Essex Regiment died 25th November 1917 aged 32 Son of Mr and Mrs. E. Benton; husband of Mrs W. Chopping (formerly Benton), of 74, Talbot Rd., East Ham, London. He is buried in the Ramleh War Cemetery Israel. Field Ambulances, and later Casualty Clearing Stations, were posted at Ramleh from 1917 onwards. The cemetery was begun by the medical units, but some graves were brought in later from the battlefields. 1/⁠4th Battalion Essex Regiment disembarked in Egypt 3rd Dec 1915, and spent until March ish 1917 on the East & West banks of the Suez canal. They were mainly defending, road, pipe & rail laying, with the odd ‘Desert column’ being sent out to track down ‘Senussi tribsemen’ on the west Bank, or Turkish outposts on the East bank. As well as heavy battle casualties, the 1/⁠4th Battalion suffered considerably influenza from during November–December 1917. Rifleman 392691 Victor Edward Bouldstridge 1st/⁠9th Battalion London Regiment (Queen Victoria’s Rifles) killed 14th April 1917 aged 25. Victor would have served at Laventie and the Fauquissart sector, where a number of the Battalions men were lost while holding three advanced posts in the German line. On March 1st 1917 they were relieved by the 6th Battalion West Yorks. On the 9th April 1917 the Battle of Arras’ began. Five days later on the 14th April The First Battle of The Scarpe, part of the Arras offensive started at 0530. The attack faltered at 0600 without the objective being reached due to heavy German artillery, rifle and enfilade machine gun fire. Victor was killed within this 30 minute time frame, his body was never found indicating that it may well have been due to high explosive artillery fire. Son of Benjamin Bouldstridge and Florence Bouldstridge (nee Butcher) of 4, Strode Rd., South Tottenham, London; husband of Dora Maria Cliff, (formerly Bouldstridge), of 43, Devonshire St., Islington, London. Born in Islington, London in 1892. Before enlisting on 22nd July 1916 Victor was a Warehouseman at Brettles on Wood Street London. He is commemorated at the Arras Memorial.